Course Description: This course is designed to develop the key oral communication, reading, writing, and media literacy skills students need for success in secondary school and daily life. Students will read, interpret, and create a variety of informational, literary, and graphic texts. An important focus will be on identifying and using appropriate strategies and processes to improve students' comprehension of texts and to help them communicate clearly and effectively. The course is intended to prepare students for the Grade 10 applied English course, which leads to college, or workplace preparation courses in Grades 11 and 12. In this unit students will discuss the elements of a short story. 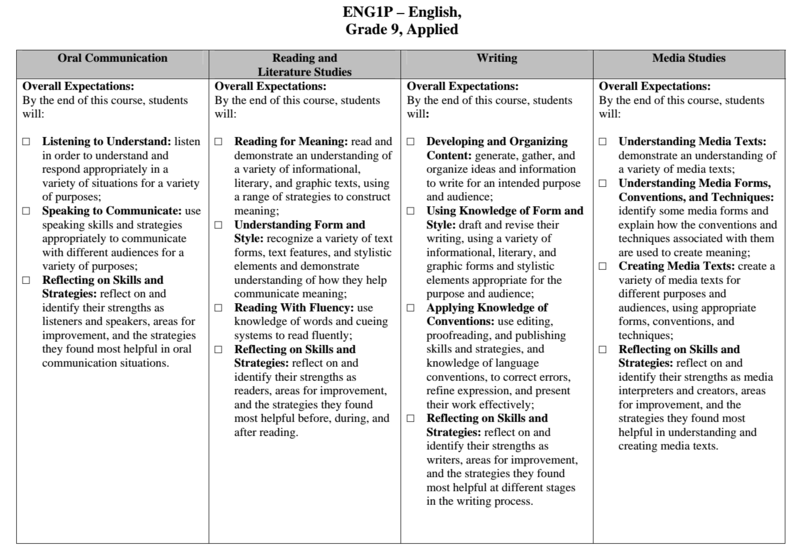 Topics focused on include P.A.C.T.S, scaffolded activities to prepare students for future writing which includes utilizing a constructed response strategy and integrating support into their writing. Students will be introduced to rhetorical devices and will create a media assignment to demonstrate their understanding how how it is used in literature. Following these studies, students will create a storyboard of a short story of their own. IIn this Unit students will begin by reviewing some of the sentence terms they learned in grades seven and eight. Then an examination of the core elements of a sentence will lead into a study of active and passive sentences, identifying subjects, direct and indirect objects, homophones and subject verb agreement. Students will also practice skills they will need for the Grade Ten Ontario Secondary School Literacy Test (OSSLT such as multiple choice answers, identifying the main topic of a selection and identifying supporting ideas. In this unit, students will read and analyze Neal Shusterman’s, Unwind. Students will participate in lessons and activities to become familiar with dystopian literature, explore various themes, write a character analysis, participate in class discussions where they will evaluated on observation and conversation and finally watch the movie The Hunger Games and write a comparison between the movie and the novel Unwind. Students will practice using a variety of sentence structures in their writing and integrating transition words and phrases to improve the flow and quality of their writing. Finally, the students will assume the role of being reporters and practice their news article writing skills which are evaluated on the Grade Ten Ontario Secondary School Literacy Test (OSSLT). In this Unit students will choose to watch two of three movie versions of this famous play. Then students will use an oral language assignment to focus on Shakespeare’s language and its complexities and write a 5 paragraph opinion essay. Students are evaluated on a 5 paragraph opinion essay on the Grade Ten Ontario Secondary School Literacy Test (OSSLT). Generating ideas and topics – teachers encourage students to design their own approaches to the material by maintaining frequent (often daily) online communication with students, by allowing some freedom in how students respond to topics and questions, and by encouraging students’ independent thinking through discussion posts..